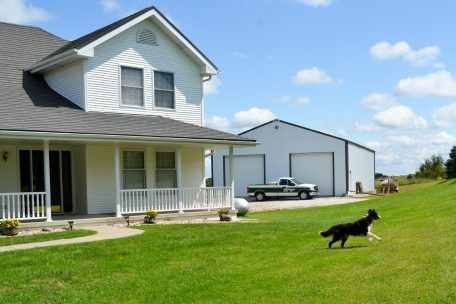 Tucked away behind this beautiful home is an awesome Astro Building. 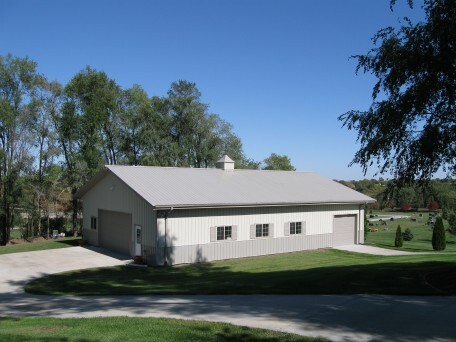 Classy building to store golfing and other recreational toys behind a beautiful home. Yep....landscape is coming soon! 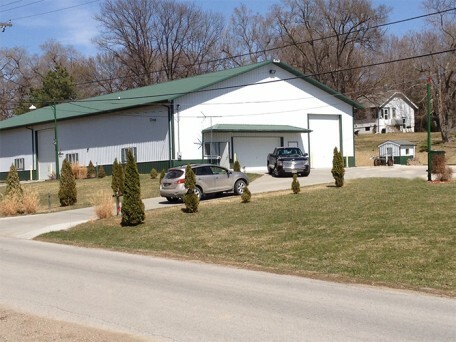 The owners loved how their Astro rep worked hard to color match their building on the hillside. 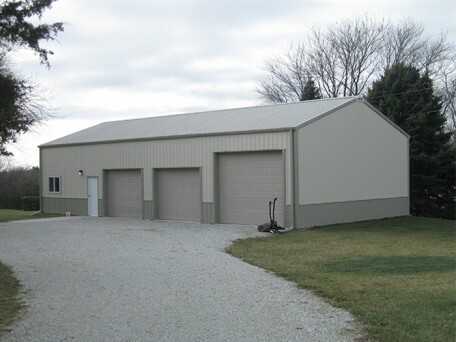 Building next to their home works as a great extra storage place for tools and toys to keep their garage focused on just the cars. 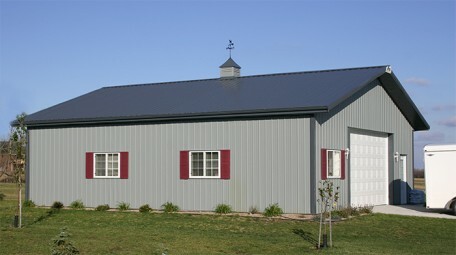 Sanctuary wins Building of the Year award! 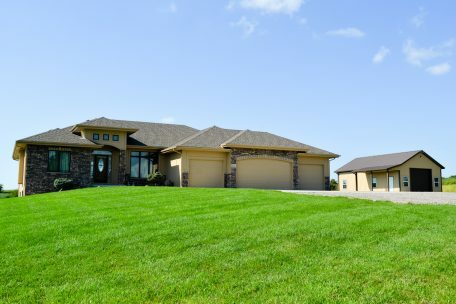 Looking for a simple design to blend with your current home? 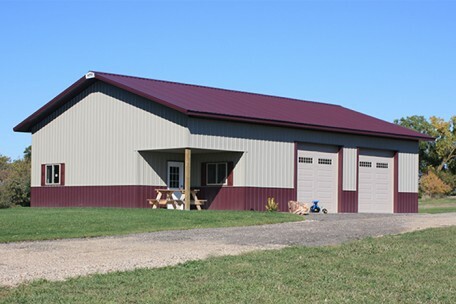 Want the deck and overhang of your home to stand out more then your Astro? Here is a classy option! 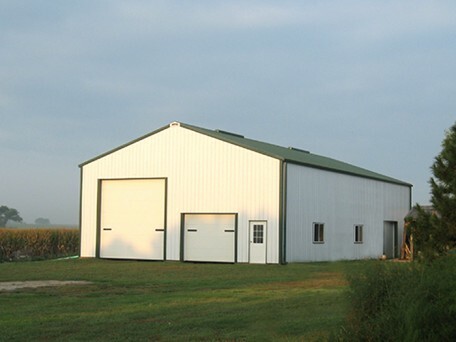 Post-Frame Building on acreage can be built by you or our caring crews. An outdoor OASIS is how these proud Astro Buildings owners describe their deck! They love to entertain. 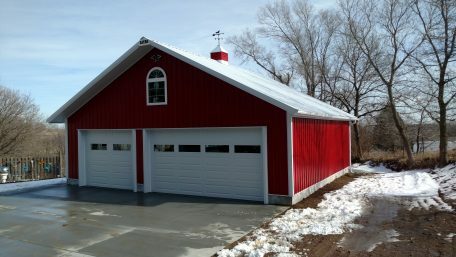 Unique doors add to the rustic look of this Astro! 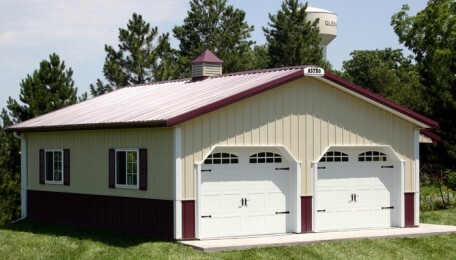 Classic taupe building colors highlighted with classic white. Eyebrow deck area. 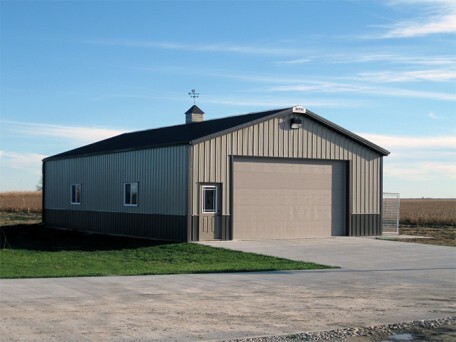 This building would look superb in any classy neighborhood of new acreage developments. 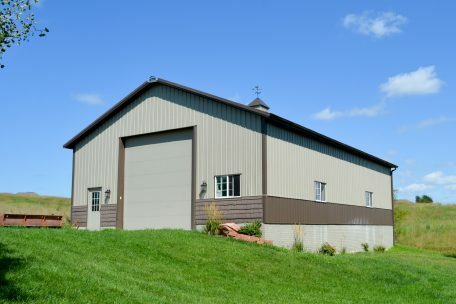 This pole barn offers living space. 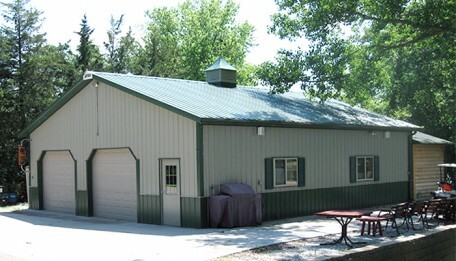 The building is used as a cabin and garage. 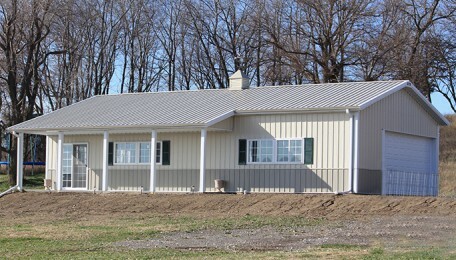 Taupe colors with evergreen shutters accented with white. Extended roof becomes a great deck for the living and entertainment area. 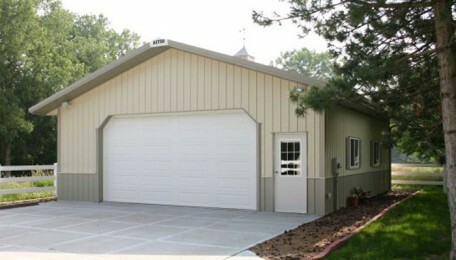 Suburban Garage with deck extension or "lean-to" features Ivory and Evergreen colors. 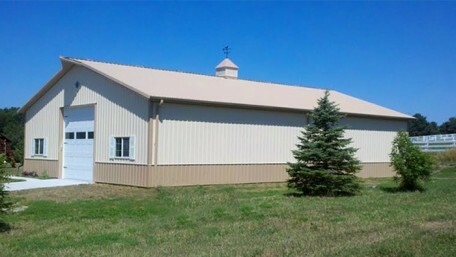 Classic Pole Barn construction. 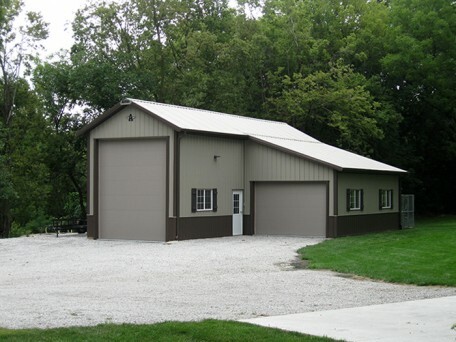 Economical and eco-friendly, this garage looks super on this acreage. 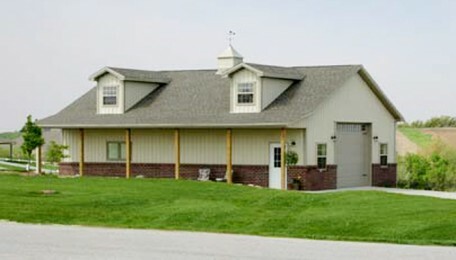 Features inset porch/deck area on this pole building. 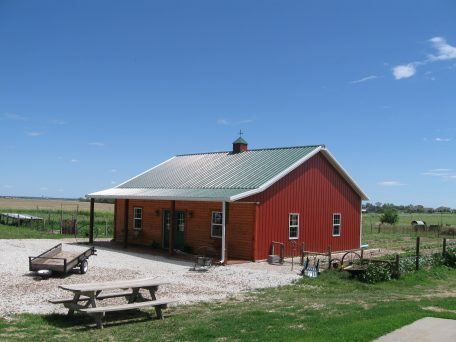 This pole building changed the owners lifestyle offering an escape to the countryside. Great for entertaining and grilling with friends and family. 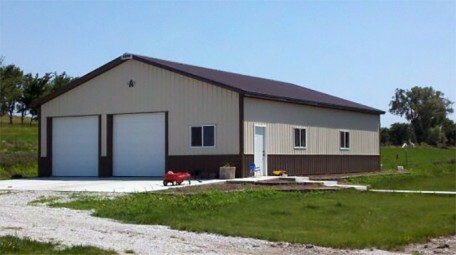 Multipurpose Building features two overhead doors, angled corners and shutters. 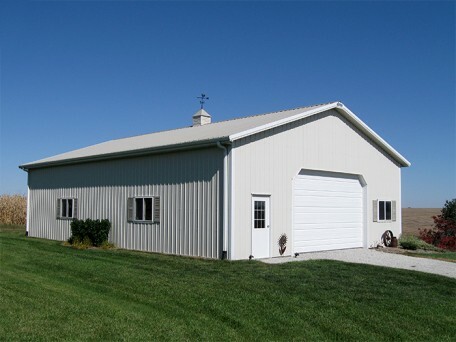 Accents in bright white creates a classy pole barn. 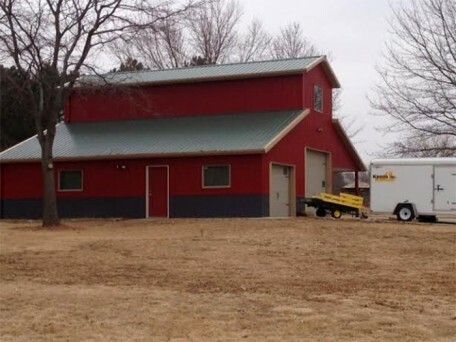 Part of an acreage this three stall garage/ pole building is nestled next to the woods, downhill from the main house. 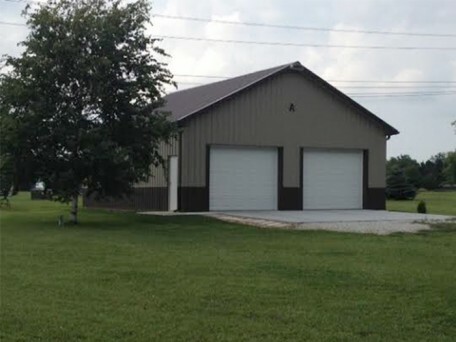 This simple pole building created a solution for the owners' storage needs. 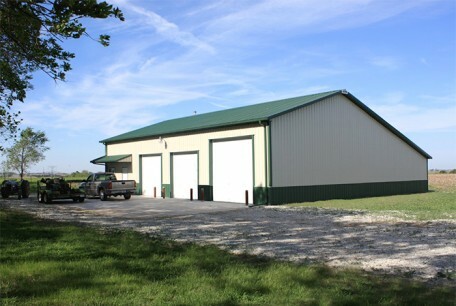 Storing a variety of vehicles, RVs and toys, this pole building was a perfect solution to protect the owners investments. 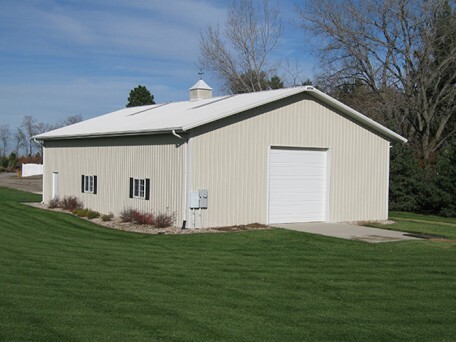 Located near Plattsmouth, Nebraska, this simple garage was the solution needed for protecting their vehicles. 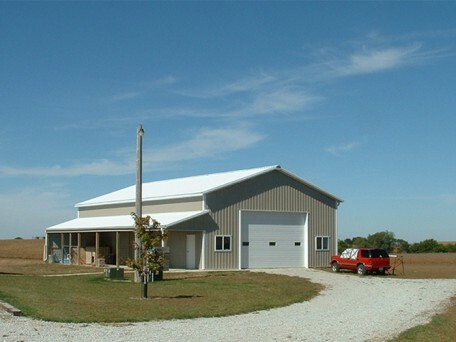 Who knew a pole building could look so good! 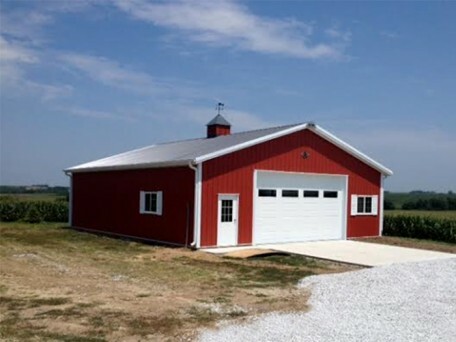 Building kits are available if you are the handy do-it-yourself type! 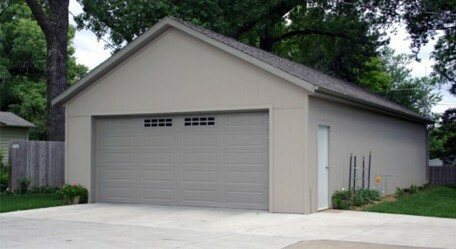 Pole built garage featuring traditional shingles fits within the neighborhood aesthetics. 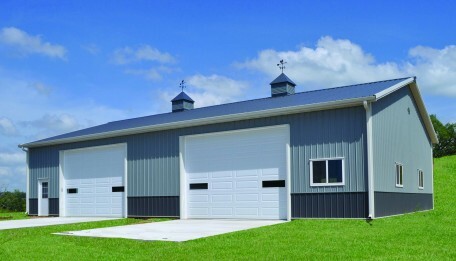 Single overhead door accents this Astro Buildings pole barn garage. 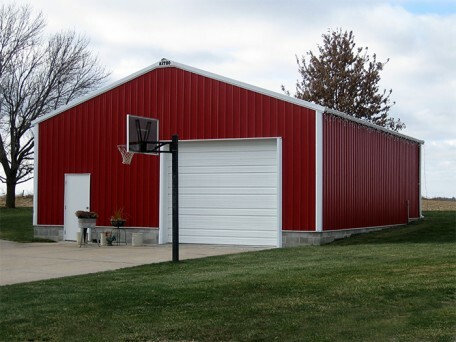 Featuring bright white accents on a red pole building garage, this solution is classy! 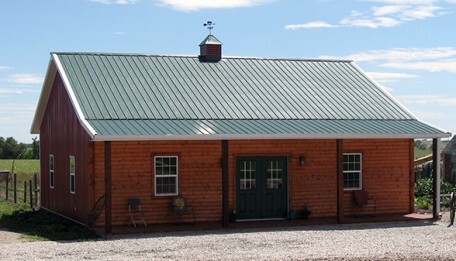 Used as a cabin getaway this pole barn by Astro meets all their needs: storage, entertainment and a place to call home. 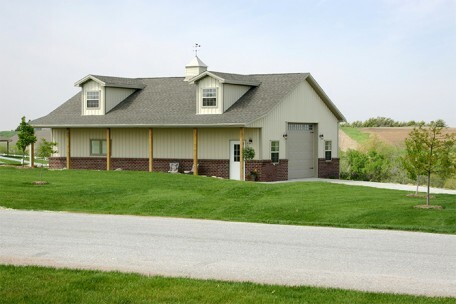 With residential style windows and a dog kennel on the side, this building is nicely designed. 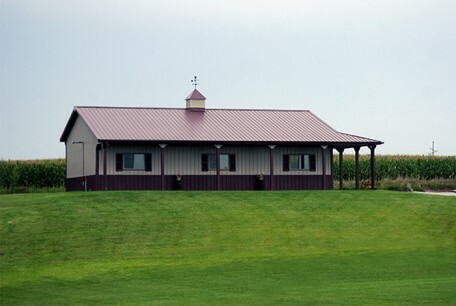 Cupola and weather vane are a nice accent. 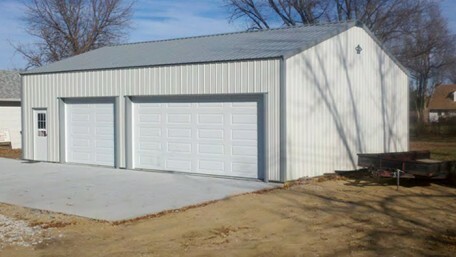 Garage near Yutan, NE. 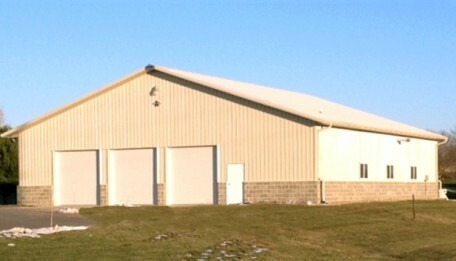 Overhead doors on two sides. 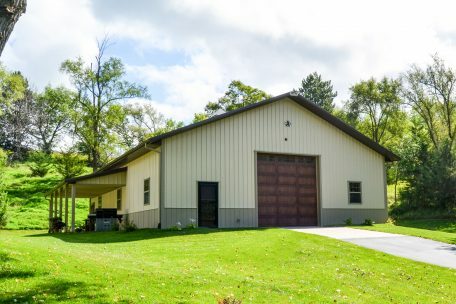 This garage is fun for all ages! 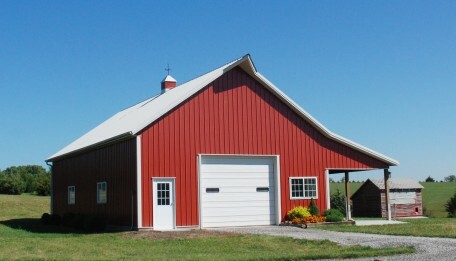 The kids can enjoy the inside during the winter and summer. 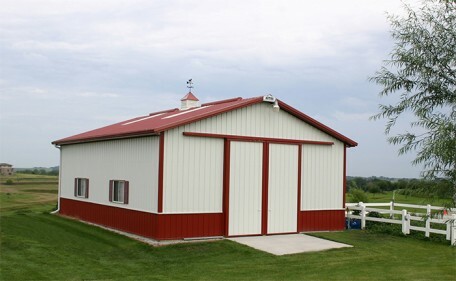 The adults have peace of mind that they invested in a solid pole building and an eco-friendly build. Down the hill from the main residence lies a beautiful pole building. 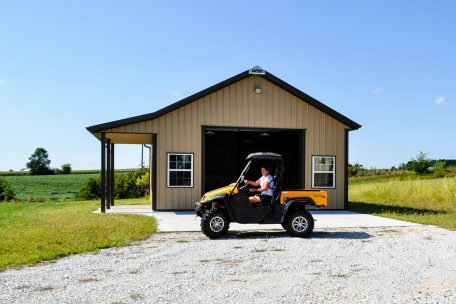 It offers office and storage solutions for their vehicles and toys. 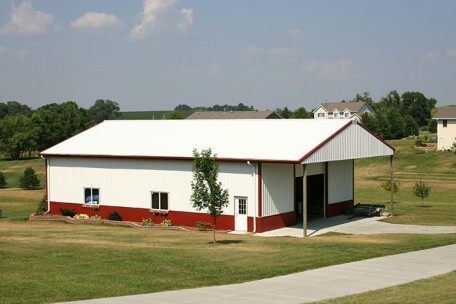 Garage with three stalls different heights. 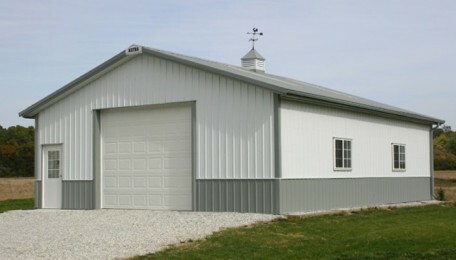 Garage with three stalls offers variety of storage solutions for this pole building. 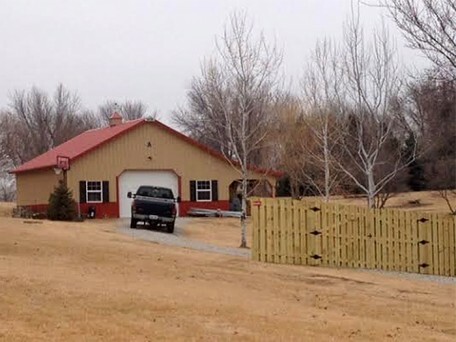 Seeking a log cabin feel but the economical smarts of a pole building? Here is your solution for living! 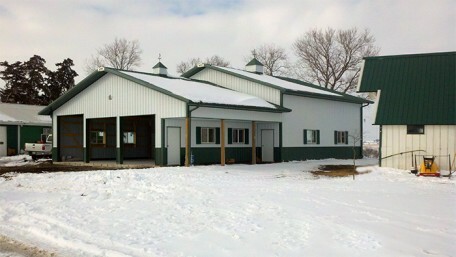 Garage features 3 stalls and office building. Wainscot in brick. 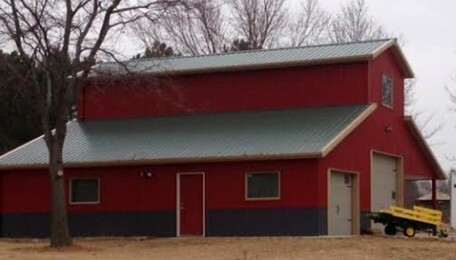 Economical and eco-friendly pole building featuring log facade. North of the Platte River, this pole building is used for storing farm equipment and a classic car. It also features an office and deck for entertaining. 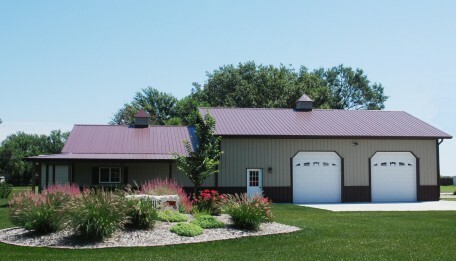 Pole barn building serves many uses for a young ag entrepreneur living north of the Platte River. 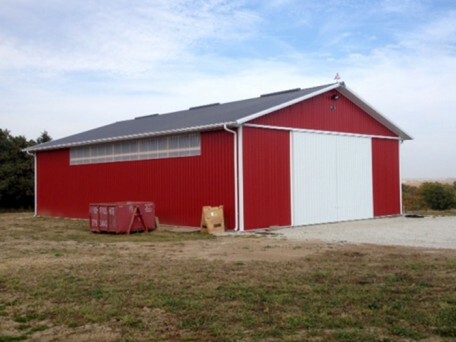 Red and white pole building features lighting solutions and sliding door. 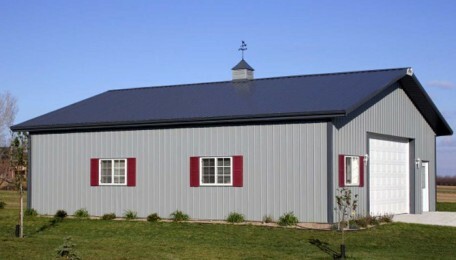 Looks like a traditional house, you would never know it has all the benefits of pole buildings - eco-friendly and economical. 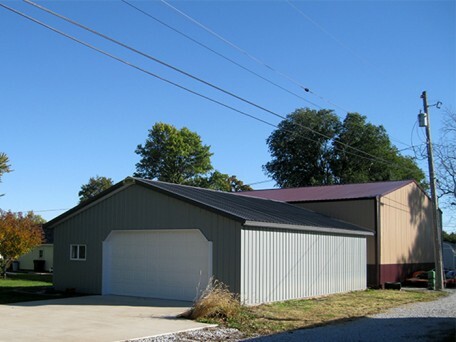 This suburban solution for living/office/storage was more economical than traditional builds. 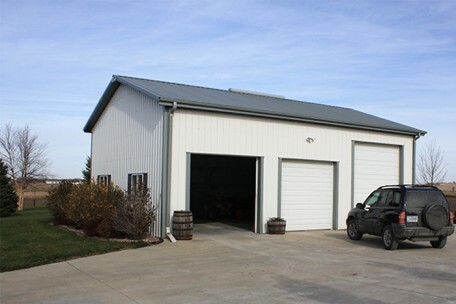 Living quarters created using a loft above the garage door storage area proved to be the solution for these Astro Builders. 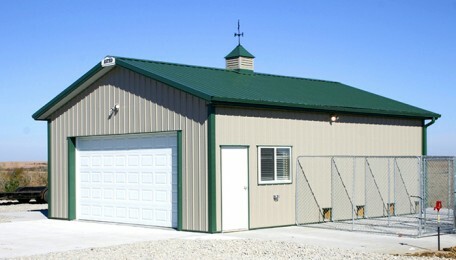 Angled Corners on the garage door look classy on this garage storage solution for agricultural or urban. settings. 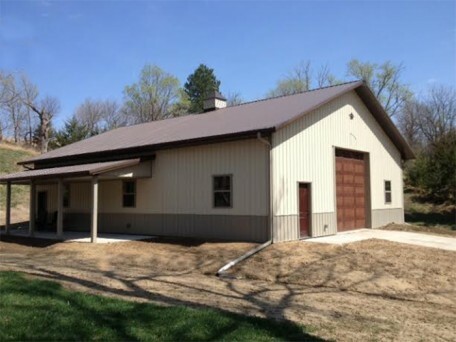 Beautiful wood appearance doors highlight this building in the woods next to a countryside home. 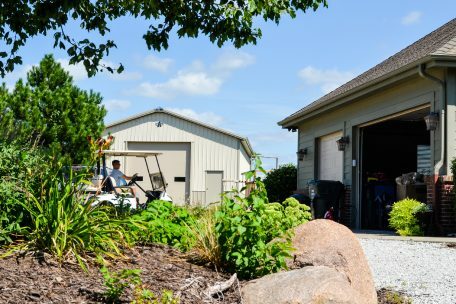 These proud Astro Owners have enjoyed entertaining outside on their deck and inside their pole building garage during the cooler weather. 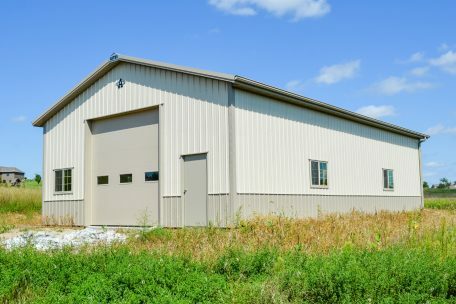 Tall overhead door allows storage for RV. 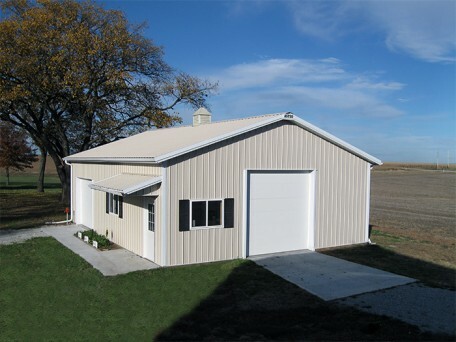 Can be built for you or purchased as a DIY kit. 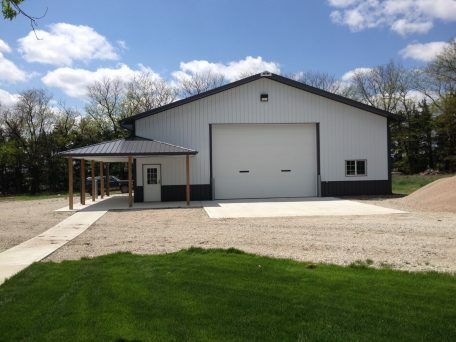 So much more then a garage, this pole building works for small farmers living on an acreage with a few animals to care for. 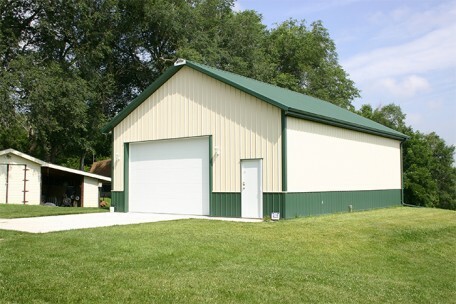 With overhead and walk in doors on this pole barn a commercial shop is created. 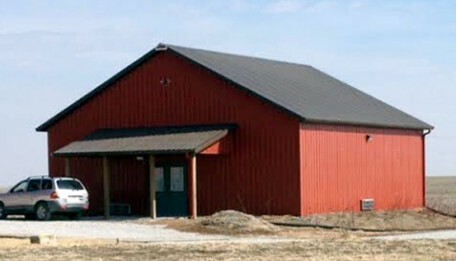 The building's eyebrow highlights the main entrance for customers. 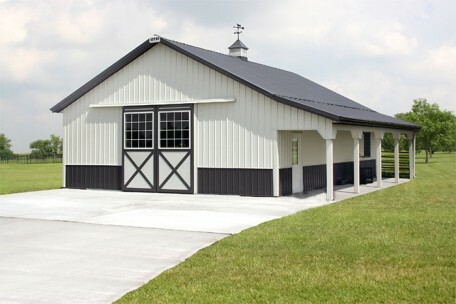 White and Taupe classy storage pole building. 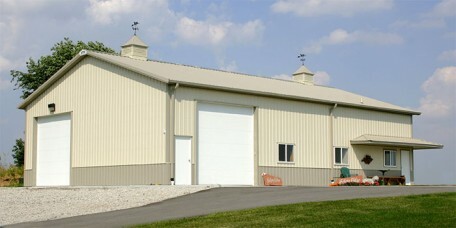 HIgh overhead door. 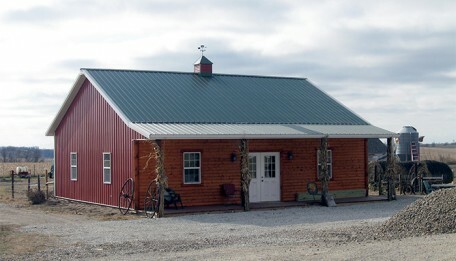 Pole Barn features cupola with weather vane, light gray wainscot and windows with grids. 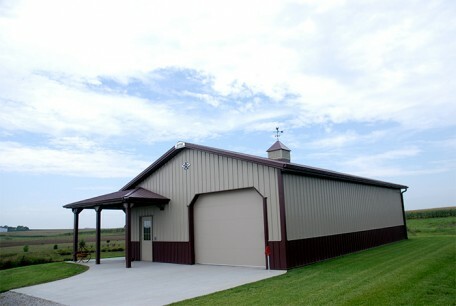 Cross Buck Sliding Doors utilizes the height of this pole building. 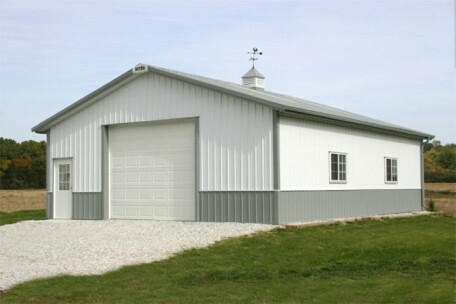 This garage and ag storage is a two tone light gray and charcoal gray super storage shed. 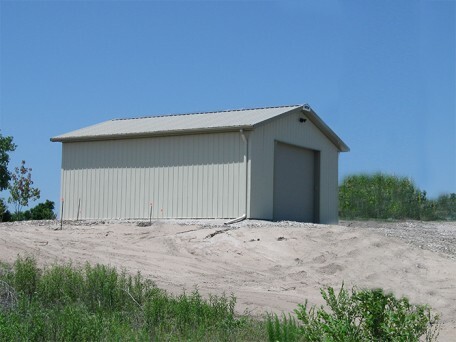 Featuring a simple design, this Pole Building can be built by Astro or could be your own Do-It-Yourself construction project. 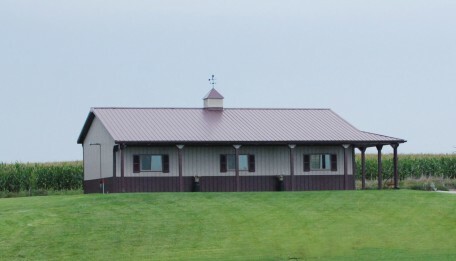 Pole Building features wainscot in brown and siding in taupe. 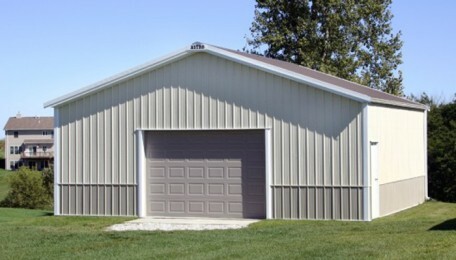 Garage with large overhead and walk door. 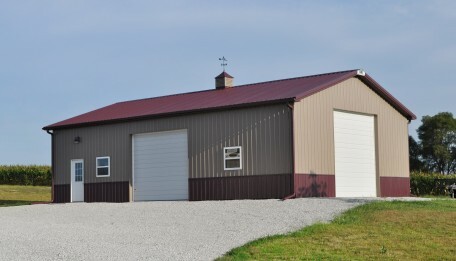 Two-tiered roof system allows one side to store taller tractors and RV's while the back side has traditional car garage doors. 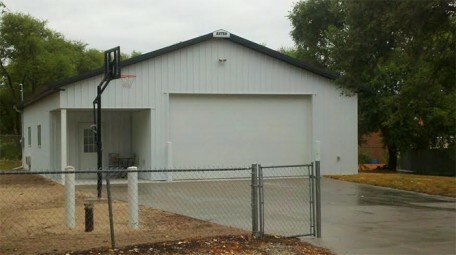 Classic garage and so much more with an Astro Building. 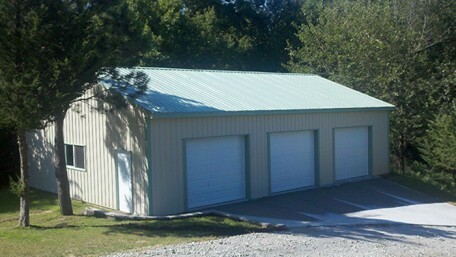 Storage solution for the family's toys - RV Storage, 4-Wheelers, Boat Storage and more. 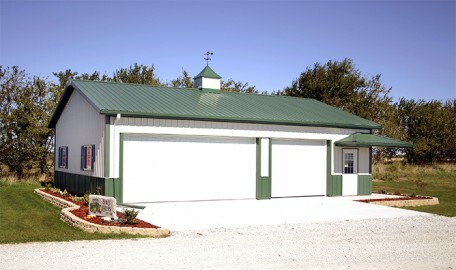 Simple pole building with windows featuring shutters create residential feel for this garage. 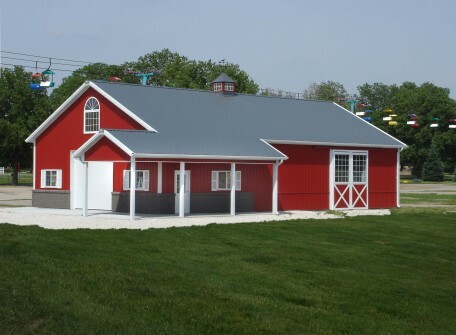 Simple touches to this pole barn such as curved corners on the wrapped poles for the deck, create a classic farm look for those with or without horses. 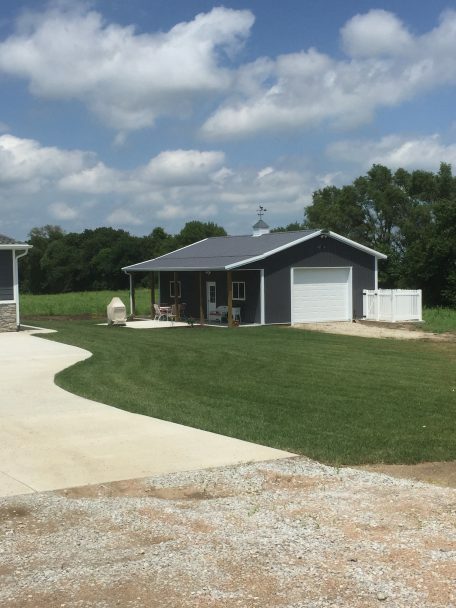 What a beautiful deck this creates from the lean-to! 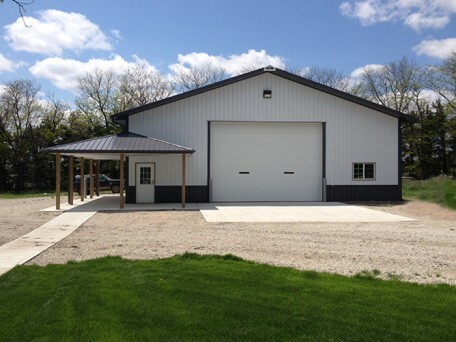 Acreage lean-to offers entertainment space on this pole barn garage. 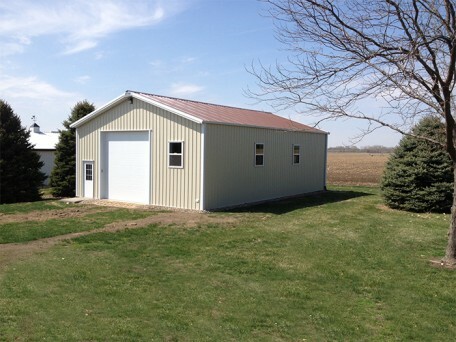 Space for storage and office use. Topped with a cupola with windows and a weather vane, this pole barn is one to write home about. 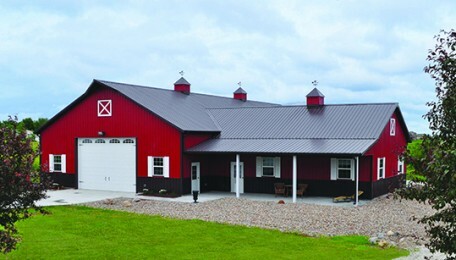 Two main tones using Charcoal Gray and Bright Red with White trim. 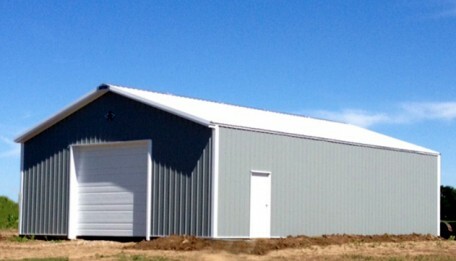 Overhead door and champion door utilized in this design. 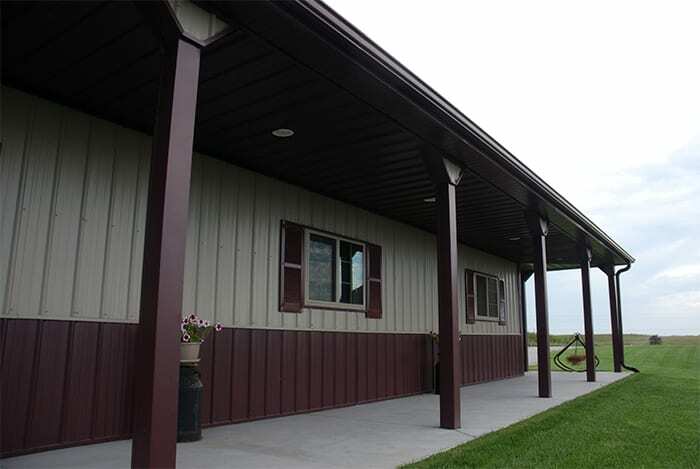 Inset Porch creates residential feel on this acreage. Wainscot in Classic Burgundy. 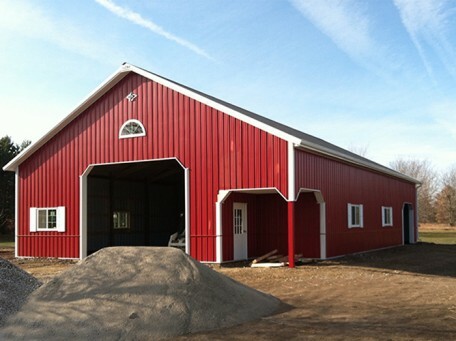 Barn Style "Gambral" building takes the best of old style barns and creates a classic new barn. 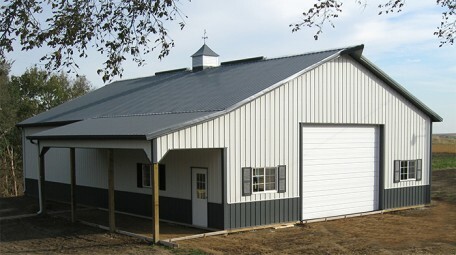 Champion doors feature the cross buck and windows. 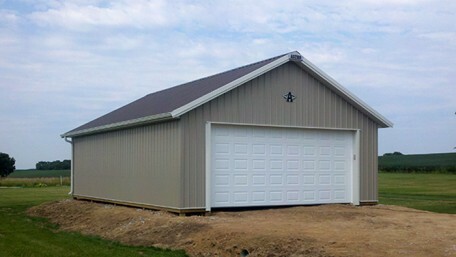 Slider Door on Pole Building Garage by Astro Buildings. 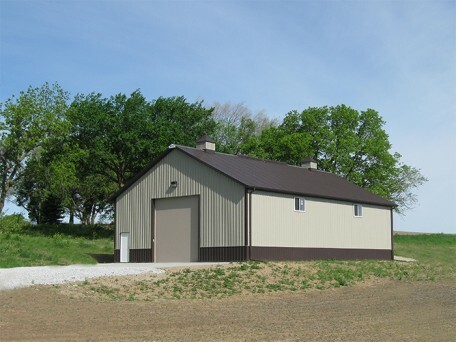 Acreage Gable Overhang Shelter Pole Building with wainscot, walk doors and windows. 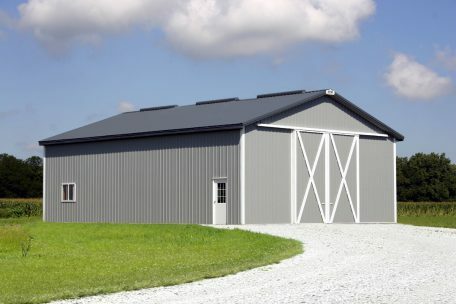 Waiscot adds residential feel to this agricultural storage solution in a pole barn. Eyebrow creates entertainment area or storefront highlighted entrance. 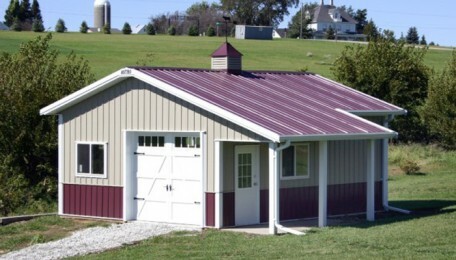 Eco-friendly and economical, Astro's garage packages may be for you. 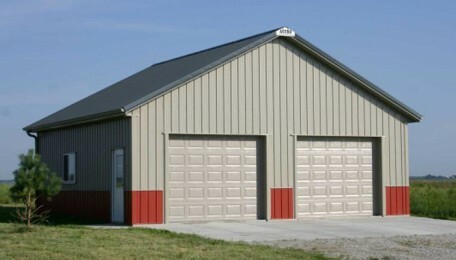 Simple Garage = Classy Design. 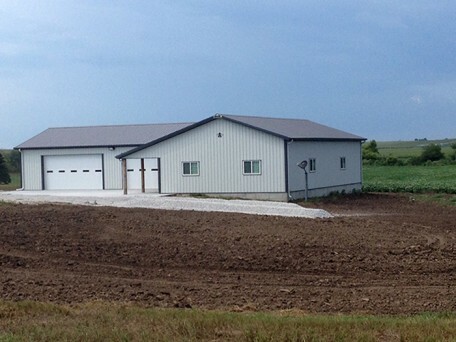 Pole Barns never looked so good. 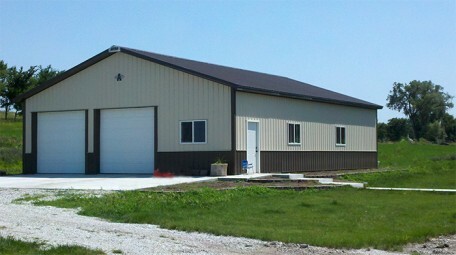 Astro Building delivers a building with eco-benefits. 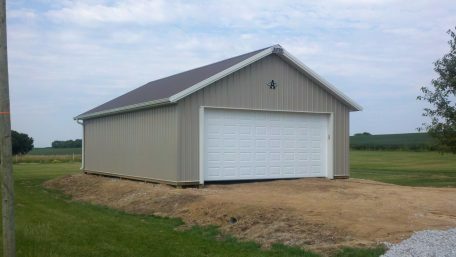 Three Stall Garage with wainscot and no overhang. 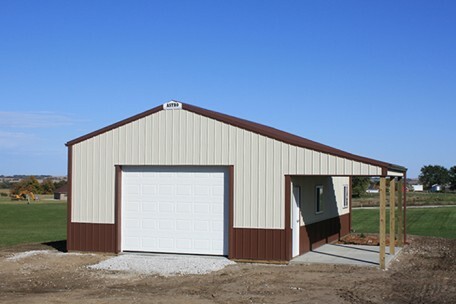 Garage featuring one single stall and a double stall for vehicle storage. 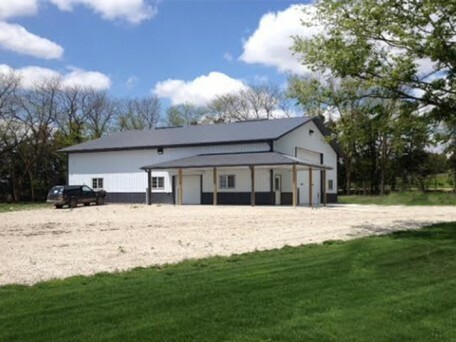 Looking to build a new barn on your property? 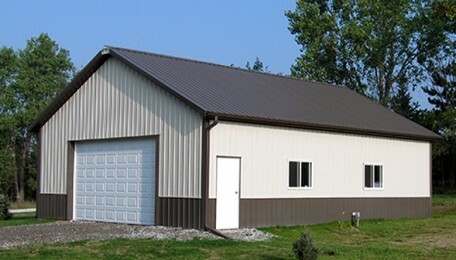 Astro Buildings provides economical and eco-friendly options in a pole barn. 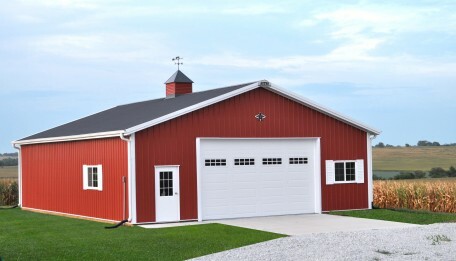 Barn style garage with loft and living quarters above. 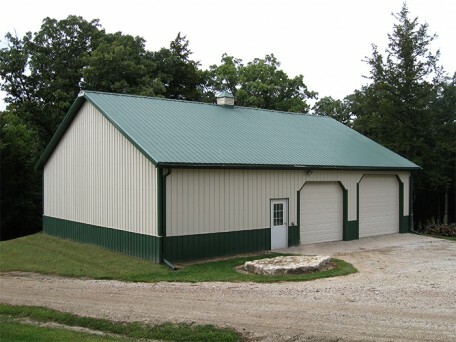 Pole buildings in today's world allows for custom designed man caves for your acreage. 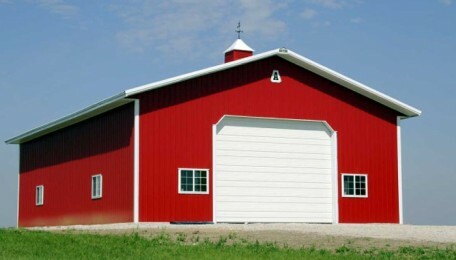 Two door garage pole barn. 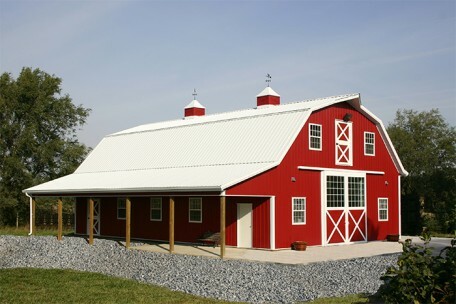 Astro Buildings showcases a beautiful setting of their buildings in suburban living! 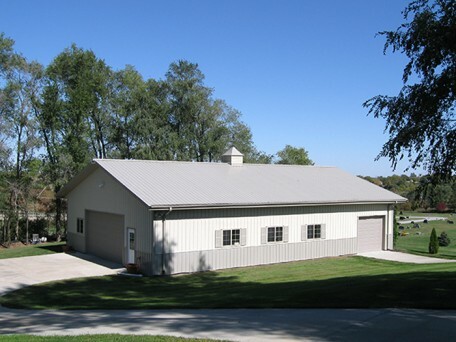 This can be used as a garage, shop, outdoor entertaining, storage to protect your investments.